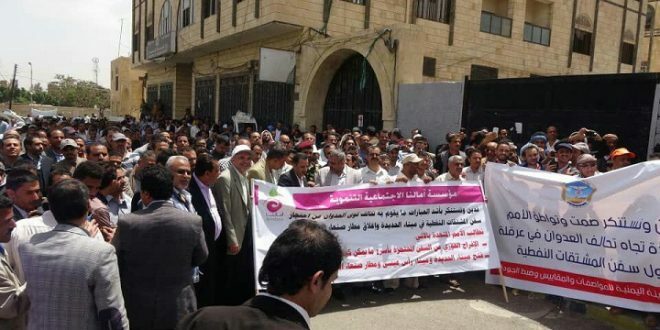 The Executive Director of the Oil Company, Yasser Abdul-Ilah al-Wahidi, and the Chairman of the Yemeni General Organization for Standardization and Metrology Dr. Ibrahim Al-Moayyed participated today in a protest held in front of the United Nations Office in Sana’a. For the ninth day in a row, the protests demand the release and allowing the entry of oil vessels to the port of Hodeidah and the stop of detaining them amid the silence of the United Nations, which did not take any actions and neglecting this case because of the consequences of the embargo the Saudis imposed on Yemen. The protest today witnessed a play about the effects and disasters caused by the coalition and the economic committee of Hadi’s to prevent the entry of oil vessels to the port of Hodeidah that are used in agricultural, health and other fields. It is noteworthy that a number of oil workers are still in front of the United Nations Office for the ninth day demanding the United Nations to do its duty and oblige the other party to abide by the charters and humanitarian laws and the release of oil vessels detained in the Fursan Islands and prevent the detention of ships under any justification as long as it is subjected to inspection by the United Nations and are granted transit permits.